On Monday, I went to a huge asian market on the way into town for another appointment. 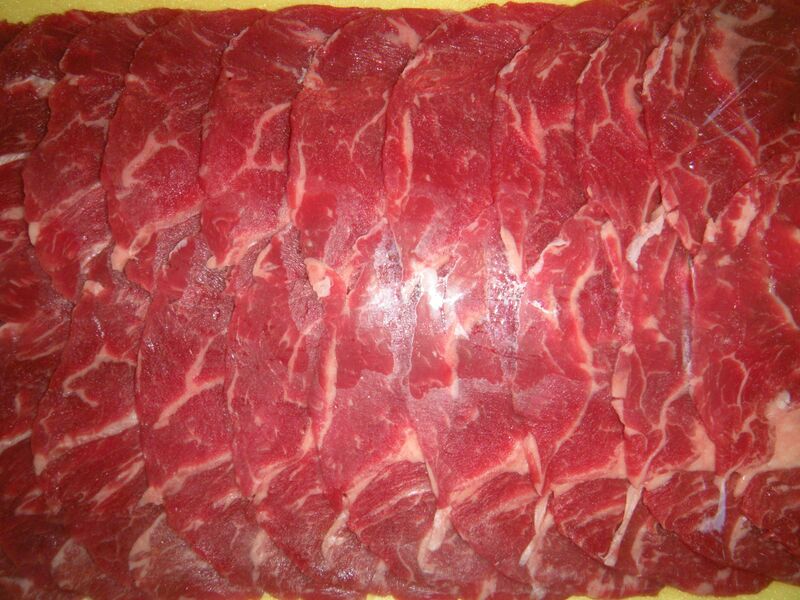 There, I picked up a package of gorgeous rib eye steak, sliced thin and gleaming up at me to make either sukiyaki or shabu shabu, both Japanese recipes that call for prime thinly sliced beef. The first thing that caught my attention when reading the recipes was the way to handle the beautiful beef: instruction to pan fry the beef in the skillet and brown it first, adding sugar or not adding sugar. Then, putting it to the side of the skillet but still on the heat and boiling napa cabbage, tofu, sweet potato noodles, scallions, mushrooms, spinach, etc. in a seasoned broth with sake, mirin, soy and sugar. You’re supposed to let the combined mixture cook for ten minutes so that the flavors of the beef and broth permeate the other ingredients. Sounds good to me, except what happens to the cooked beef while all the rest of this boiling of the stock goes on, and for ten minutes? Wouldn’t it be tough and chewy by the time everything else was cooked through enough, especially when we have such gorgeously THIN pieces of rib-eye? Not finding anything in the recipes that allayed my concerns about over-cooking the beef, I decided to buy some sake, which I enjoy drinking anyhow, warmed up. 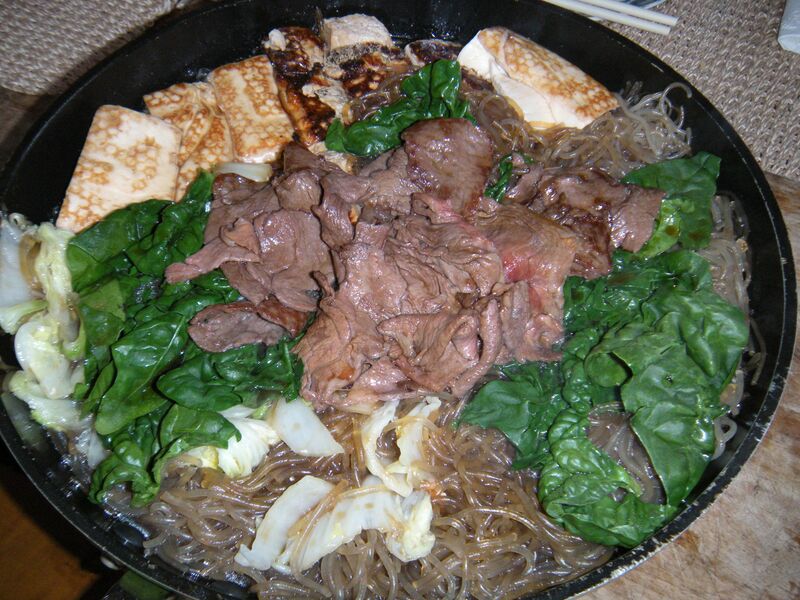 I think what I will do is to saute the beef slices in the beginning, remove most of it from the pan except for a couple of pieces left in the skillet to give flavor to the napa cabbage, spinach, tofu and noodles. When the hot pot ingredients are ready to serve, I’ll then place the medium rare pieces of beef that I held aside to the broth, let it settle in and then serve it immediately. 1. I cooked the sweet potato noodles (dangmyen) until they were tender, drained them and then put them back into the pot after using kitchen shears to cut them into smaller pieces. I then added soy, mirin, dashi and sugar to them and let their heat mix it in until these liquids were dissolved. Sort of like par-seasoning the noodles ahead of time. 2. I prepared the tofu by cutting blocks of soft tofu (that’s all I had and I didn’t want to go out to the store just to buy firm tofu. I basted the rectangular blocks with some Korean bulgogi barbecue sauce and crisped them in a skillet with a little oil. They came out gorgeous and smelled divine. 3. I cut up half a small head of napa cabbage and sauteed it in a little oil in a separate skillet. Removed it when it was fully cooked but still crispy, putting it aside. 4. 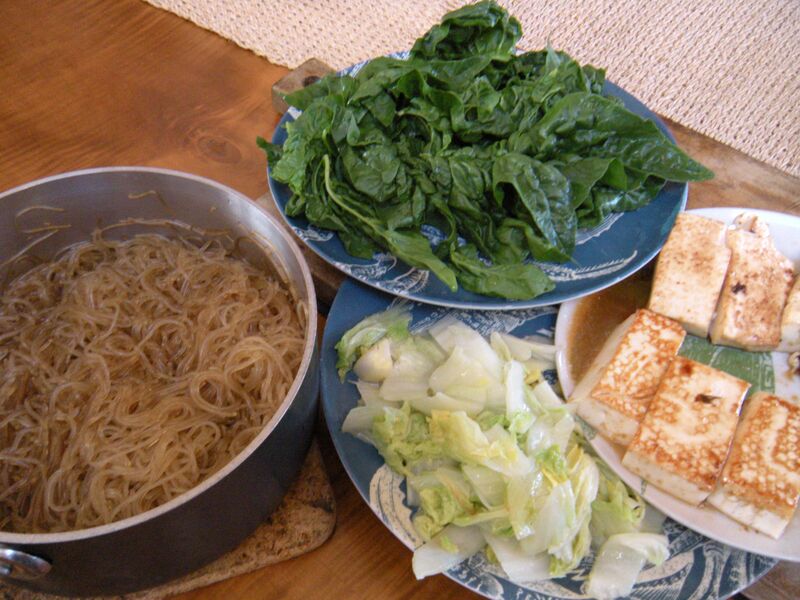 I cleaned some beautiful pieces of Chinese spinach, tearing out the most fibrous stems and leaving the dark green leaves to add at the last minute to the sukiyaki hot pot. 5. I made the most important sauce, using te-dah!, Bobby Flay’s recipe (yep, that’s right) soy sauce, a little sugar, mirin and dashi stock. I cooked this until all the flavors were blended and it was delicious. 6. Sliced up four green onions into two inch lengths and set aside. When it was time for dinner, I used a large skillet, coated the bottom with grapeseed oil and at medium high heat, seared some pieces of thinly sliced rib eye beef. Sprinkled the raw side with a little brown sugar and then turned them to cook the other side. Then I took them out of the skillet to add at the end of the dish. The beef drippings were still there as I sauteed the green onions, then placed in segregated sections the napa cabbage, barbecue crisped tofu blocks and sweet potato noodles around the perimeter of the skillet. Poured in the prepared Bobby Flay sauce which was full of flavor. Put on the lid of the skillet and let it all simmer for two minutes. Then turned everything over, added the fresh spinach and let simmer another two minutes. In the well in the middle, I gently placed the medium rare beef and covered it for one more minute. Then, I ladled an arranged sukiyaki bowl for G. and me, beating a raw organic egg in a separate bowl to use for dipping. Here it is so you can see for yourself how it looked right before we ate it. I have to say, it was worth the extra preparation beforehand because everything in the dish was flavorful and cooked through, while the thin prime rib slices remained medium rare, front and center, savored in all its glory. Yum! I think I just enjoyed a vicarious meal! I couldn’t read fast enough to keep up with my appetite.